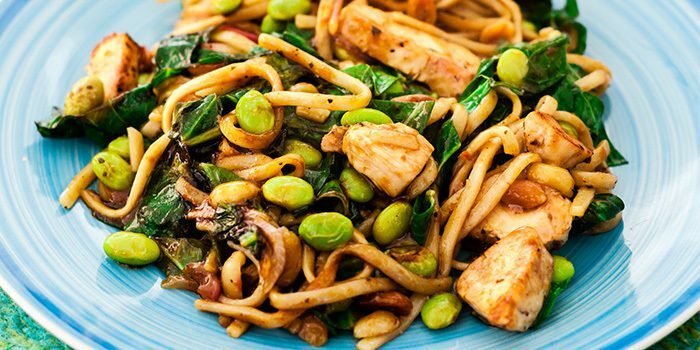 In this recipe, we used buckwheat soba noodles instead of pasta in this Asian-inspired chicken dish. 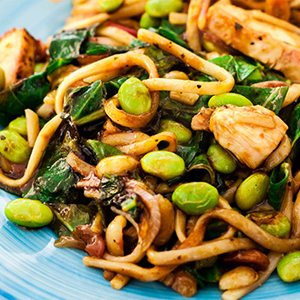 It’s loaded with leafy greens, fresh edamame, and crunchy peanuts. Enjoy hot or cold! Combine broth, peanut butter, soy sauce, honey, garlic, and ginger in a medium bowl; whisk to blend. Set aside. Heat oil in large skillet (or wok) over medium-high heat. Add chicken and onion; cook, stirring frequently, for 4 to 6 minutes, or until onion is translucent. Add spinach; cook, stirring frequently, for 2 to 3 minutes, or until spinach is wilted. Add edamame, noodles, broth mixture, red pepper (if desired), and peanuts; cook, stirring frequently, for 2 to 3 minutes, or until heated through.